Kempinski Hotels is ushering in a new era of first class hospitality with the opening of The Apurva Kempinski Bali, a luxurious haven that captures the essence of Indonesian culture, art and identity. 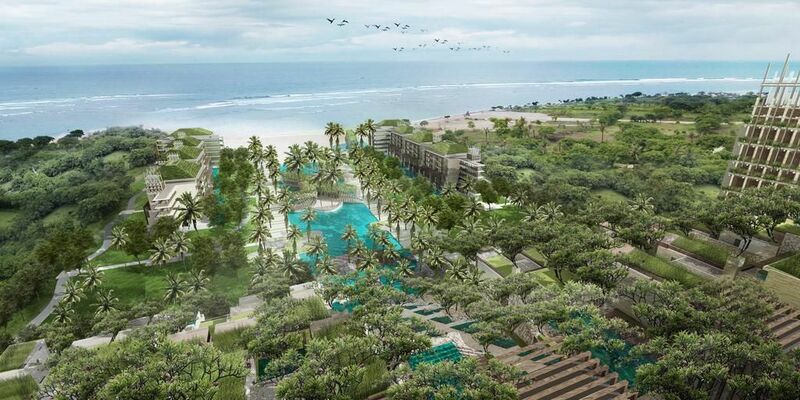 The resort will open on February 1, 2019, in the upmarket Nusa Dua area of Bali, with 475 well-appointed guestrooms, striking suites and discreet villas in a quiet beachfront setting. Six restaurants, bars and lounges allow guests to soak in the sensational natural setting, with sweeping views and indoor/outdoor dining venues that celebrate regional flavours. An immersive ocean-facing spa and fitness centre offers treatments inspired by traditional Balinese healing practices, to promote balance and wellbeing. Other facilities include a 60-metre swimming pool and a separate kids’ pool, and an innovative family club creates meaningful shared moments for families of all ages. For events, business meetings and weddings, The Apurva Kempinski Bali offers a 1,076 sq m pillar-free ocean-view Grand Ballroom and a collection of meeting rooms with ocean vistas. The Apurva Kempinski Bali cascades down the hillside like one of Bali’s iconic rice paddies, emerging from the cliff tops and gradually making its way down to the Indian Ocean. Award-winning architect Budiman Hendropurnomo of UK-based Denton Corker Marshall drew inspiration from the rice terraces and their centuries-old ‘subak’ irrigation system to create the concept for the property. Modern Balinese architecture pays homage to the island’s natural landscapes and manmade temples, in a symphony of natural-clad stone buildings, bougainvillea-covered terraces and a network of waterways and shimmering pools. Tumbling waterfalls emerge from the lush landscape, flanking the resort’s spectacular Grand Staircase. The 250-step walkway, inspired by Bali’s sacred Pura Besakih water temple, runs through the centre of the resort, and provides a stage for nightly rituals. Starting from 65 sq m, accommodation at The Apurva Kempinski Bali is generously proportioned and guarantees exceptional views. At the upper end, a selection of 43 One-, Two- and Three-Bedroom Exclusive Villas offer up to 1,379 sq m of luxurious space, with private pools and lounge areas, tropical gardens with outdoor showers and access to the exclusive Villa Lounge. Spread across the resort, 162 exclusive cliff top and oceanfront Junior Suites and 14 Specialist Suites have private plunge pools, and guests benefit from access to the Cliff Lounge and it’s panoramic pools. The remaining 256 Grand Deluxe Rooms ranging from 65-80 sq m are beautifully appointed, with décor featuring traditional Indonesian patterns and spectacular views. 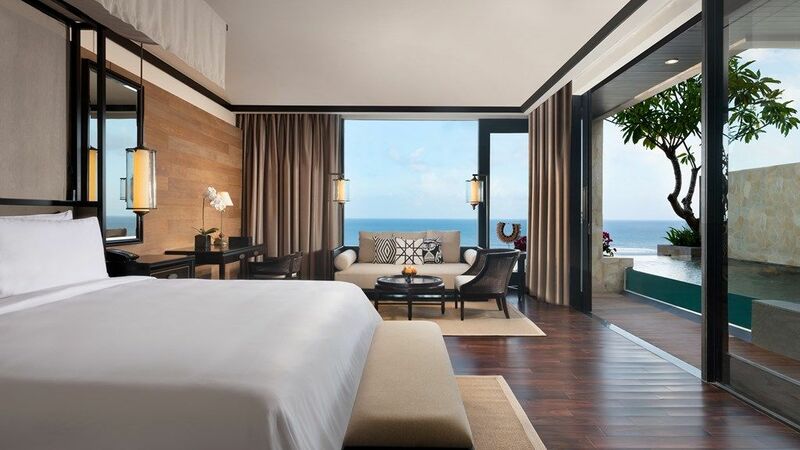 In the guestrooms, rich, exotic woods, local fabrics and typical Indonesian motifs create an understated and sophisticated atmosphere that’s both luxurious and homely, while the views of the ocean and surrounding landscape tell their own story through wide panoramic windows. The Apurva Kempinski Bali is home to a collection of culinary experiences, presenting colourful, flavourful dishes that celebrate the cuisine of Indonesia and the wider Asia region. Coastal delicacies from around the archipelago are on offer at Koral, Bali’s first aquarium restaurant, while Japanese flavours are showcased at Izakaya by OKU, an outpost of the award-winning OKU restaurant at Hotel Indonesia Kempinski Jakarta. In the lobby, Selasar Deli serves refreshments like speciality luwak coffee and jamu herbal tonic; live cooking stations tantalise with local and international flavours at All Day Dining Pala Restaurant & Rooftop Bar; and there’s casual oceanfront dining at Reef Beach Club. Guests can also taste an array of refreshing beverages poolside at Kubu Pool Bar. At the front of the resort, overlooking the ocean, Apurva Spa is a relaxing haven, where body and beauty treatments are inspired by time-honoured Javanese and Balinese wisdom. The philosophy is based on the ancient proverb ‘rupasampat wahyabiantara’: true beauty is achieved when outer beauty is in harmony with inner beauty. Traditional ointments such as lulur, a herb and spice body scrub, will help achieve outer beauty, while activities such as sunrise yoga and meditation will pave the path to inner harmony and balance. Treatments are tailor-made for each guest based on the four stages of life: teenage, adult, married and post-adult, with different varieties of oil and lulur selected depending on specific individual needs. The Apurva Kempinski Bali’s lush beachfront location, just 15-minutes from the airport, and its generous inventory of rooms and suites will make it a popular destination for meetings and events, a wonderful stage for memorable conferences, and a spectacular backdrop for the most elaborate weddings in Bali. The 1,076-sq m pillar-free Grand Ballroom can accommodate 900 delegates for large-scale conferences, and a choice of smaller event spaces and boardrooms provide plenty of choice for meetings. The 2,200-sq m ocean-facing lawn offers a blank canvas for al fresco cocktail receptions or celebrations under the stars, and three wedding chapels provide options for weddings large and small.